Pierre Hermé’s flawlessly formed croissants are one of the reasons I enrolled in the Classic Pastry Arts program at The FCI—they are that good! Everything I’ve tried in his Parisian pâtisserie is delicious and gorgeously presented at an almost obscene level of perfection, but it’s his croissants that keep me coming in again and again whenever I’m in Paris. Not only are they unbelievably flaky and delicious, but because the French regulate the cost of staple food items such as croissants (only in France would a pain au chocolat be considered a necessity), they are also affordable compared to the other offerings in his shop. And so, I start each morning in France by popping one of his croissants into the oven and waiting impatiently for it to warm before taking that first bite with large dollops of jam. 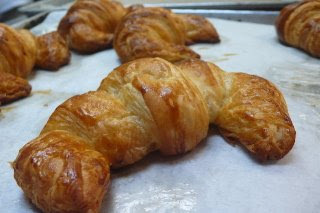 As we embarked on making our first croissants in class this week, that’s the vision I nervously held onto. Taste and texture-wise, they were pretty good, but in terms of form I have a long, long way to go (as evidenced in photo). The rolling out of the croissant dough turned out to be the relatively easy part—it’s the shaping part that takes lots of practice. Thankfully, we’ll all have a lot more chances in future classes to master croissant making techniques. Besides croissants, we also made brioche, fruit cake, pecan Danishes, blueberry muffins, and Kugelhopf. 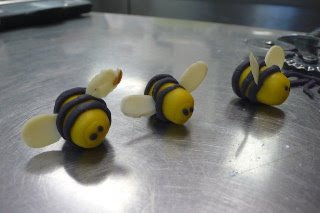 Amanda Beun, my fantastic partner for the unit, made the cutest bumblebees out of marzipan for the sticky meringue beehives we made in the last Viennoiserie class. The unit will return later on in the curriculum, but for two more classes we focused on puff pastry once again and made chocolate mille feuille, banana tarts and dartoise. Up next: the puff pastry practical and written exams and the beginning of the cakes unit!